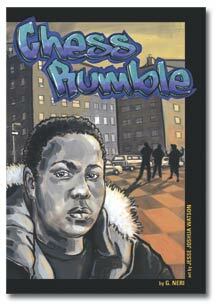 This past weekend, I read G. Neri‘s Chess Rumble, illustrated by Joshua Watson. Got my copy at the newspaper where I work. Couple times a year, they hold a huge book sale with proceeds going to charity. The books are sent from publishers hoping for media exposure. I made it to the sale three hours late, so I was thrilled to see Chess Rumble hadn’t been snatched up. 11-year-old Marcus suffers great loss: the death of his sister and his father’s detachment from the family, following the death. Daddy didn’t tell stories no more. Just sat by hisself at that dang chessboard till all the ghosts in his head chased him away forever. After his parents split up, Marcus is left to be the man of the house. Spirit-broken and angry, he lashes out, fighting with his younger twin brothers and raising a fist to his mom in a heated discussion. When taunted by a bully at school (He got called Fattie in front of some girls) he not only raises his fists, but he uses them, too. On the verge of getting kicked out of school, Marcus meets the Chess Man (CM), a tough older dude, who apparently sharpened his chess game while serving time in jail or prison. CM challenges Marcus to fight his battles on the chess board. Through lessons learned from CM — about life and chess — Marcus gains a new confidence within himself, and he learns the value of thinking ahead and defeating his problems by having a game plan. After reading Chess Rumble, I realized my 6-year-old son and I hadn’t played in awhile. I pulled out the ol’ chess board and we played a few rounds. As we played, I advised my son in the same way CM had advised Marcus: “Don’t blindly move your pieces around the board,” I told him. “Identify my King, your target. Think ahead a few moves. Make a plan.” Then I beat my son like a dusty old rug. Three times. This free verse story is told in first-person. It’s a quick read, and I enjoyed it very much. I wish there were books like this when I was a kid. And I gotta give G. Neri his props for so successfully capturing the voice of a troubled 11-year-old, African American male from the hood. Marcus’ language is street, conversational and real. He talks just like I did at 11-years-old, and often still do. Watson’s acrylic illustrations are strong and bold, full of emotion, and have a graphic art quality about them. I’ve heard good things about Chess Rumble. I’m most excited that it’s a MG since middle school boys are often not thinking much about reading. But they might with books like this.